A Monologue with Echo – Sennheiser. 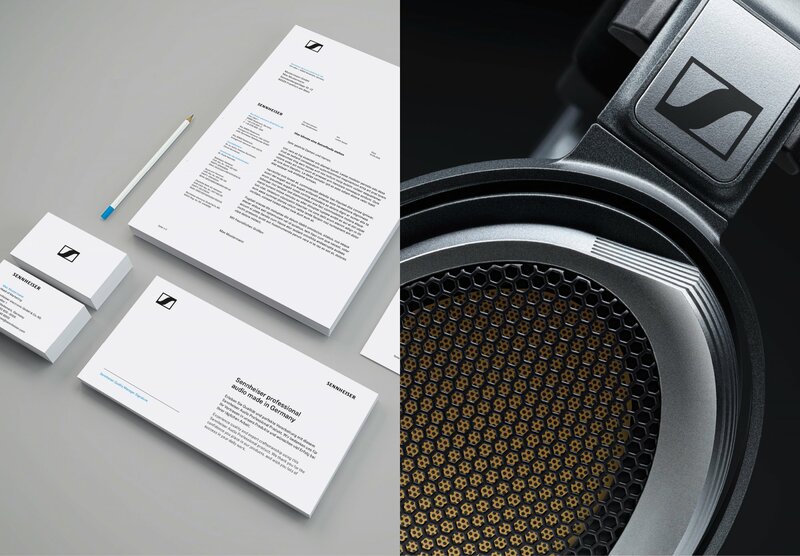 Finn Fukazawa and Oliver Berger presented the new look of Sennheiser, the high-end microphone and headphone systems manufacturer. Fol­low­ing an inter­nal strate­gic reor­ga­ni­za­tion of the com­pa­ny, work on the cor­po­rate design was not con­tract­ed to an exter­nal agency, but was tak­en on in-house by the design man­age­ment team at the company’s Zurich loca­tion. The design­ers reflect­ed on the per­cep­tion of the brand and defined a new com­mu­ni­ca­tion goal: a shift away from the sup­pli­er of tech­no­log­i­cal sys­tems to a com­pa­ny that makes sound qual­i­ty an expe­ri­ence – all the way through the prod­uct range and all of the company’s brand­ing. 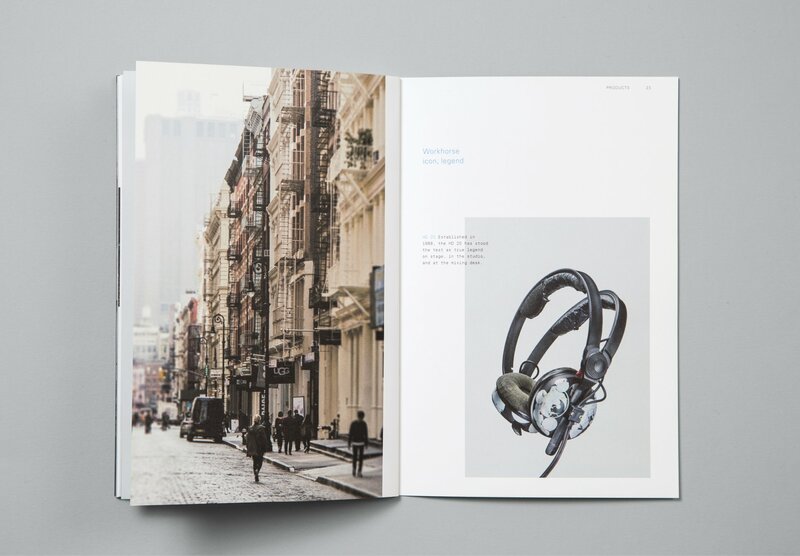 The rea­son Sennheis­er decid­ed not to buy in the design but to anchor it in the com­pa­ny itself is deeply embed­ded in the whole oper­a­tion: “Cus­tomers can’t dis­tin­guish good head­phones or good sound qual­i­ty any­more. These things are only mea­sur­able using tech­ni­cal equip­ment. 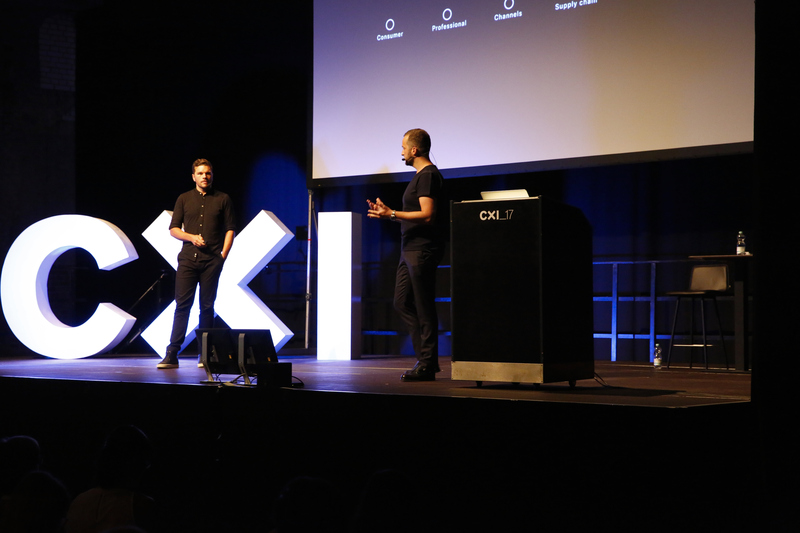 You have to know, feel, and actu­al­ly make the prod­ucts your­self,” Oliv­er Berg­er explained. This hands-on atti­tude is evi­dent in the extreme lev­el of detail that goes into Sennheis­er prod­ucts: recent­ly, the world’s best head­phone, the Sennheis­er HE 1 was launched. Anoth­er unique fea­ture of the com­pa­ny: design and mar­ket­ing are kept sep­a­rate from each oth­er. “Mar­ket­ing is a short-term process. Its pri­ma­ry goal is to sell fast,” says Oliv­er Berg­er. Six years ago, it was decid­ed to move the design depart­ment from the com­pa­ny head­quar­ters in Hanover to Zurich. Brand­ing and Design report to one of the two broth­ers of the fam­i­ly busi­ness, Andreas Sennheis­er. “It feels like an agency. We just have dif­fer­ent busi­ness cards,” explained Finn Fukaza­wa, who was pre­vi­ous­ly man­ag­ing direc­tor of the Frank­furt agency Heine/Lenz/Zizka. 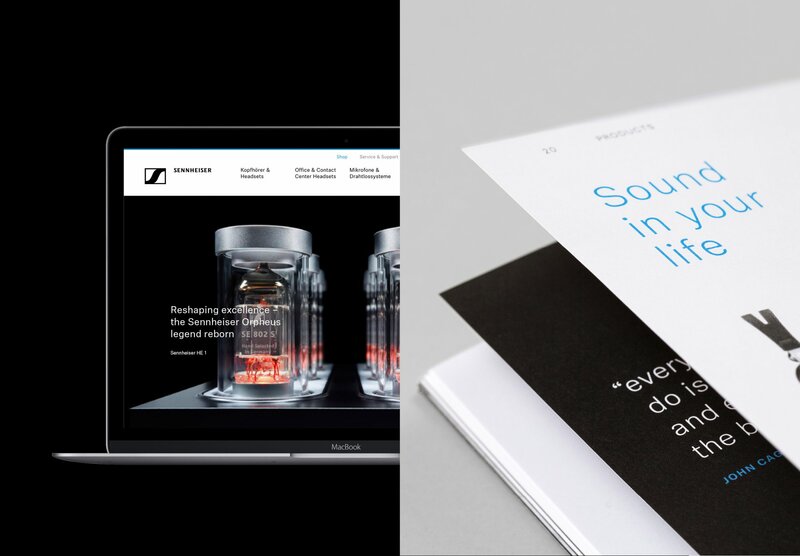 The design­ers asked them­selves: What is at the core of the Sennheis­er brand? Is there some­thing that holds every­thing togeth­er? Oliv­er Berg­er: “We’re always look­ing to the next prod­uct. But real­ly we should think a lot more about where we come from and what we stand for”. The style of the entire range of prod­ucts was rede­fined with this in mind. And what about the brand com­mu­ni­ca­tion? Finn Fukaza­wa joined the com­pa­ny a year and a half ago. His crit­i­cism was, “The appear­ance was extreme­ly one-dimen­sion­al, rely­ing on a lot of cliché, extreme­ly het­ero­ge­neous.” Oliv­er Berg­er point­ed out in defense of the past that there hadn’t been any glob­al mar­ket­ing effort up to then, no glob­al design. Sennheis­er is a small com­pa­ny with less than a tenth of the bud­get big com­peti­tors can draw on. Each busi­ness unit world­wide did what it want­ed. That had to change. The word / fig­u­ra­tive mark was care­ful­ly reworked, the let­ter­ing made more leg­i­ble and eman­ci­pat­ed from the image work. In this way, the word mark can now stand alone. The image mark has been sim­pli­fied and can now be used like an icon. We need a new font! The orig­i­nal type­face wasn’t made for dig­i­tal appli­ca­tions such as apps, and license exten­sions for these uses made it nec­es­sary from a legal point of view to com­mis­sion a new pro­pri­etor font. The mon­ey saved on the license fees was invest­ed in a com­pre­hen­sive font with eight cuts and a mono­space vari­ant as well as numer­ous icons. The design­ers were very hap­py about this, because it’s usu­al­ly extreme­ly dif­fi­cult to explain the ben­e­fits for cor­po­rate design to CEOs. Schick Toik­ka from Berlin designed a mod­ern sans serif for Sennheis­er, based on New Hel­veti­ca. Clear, pre­cise, archi­tec­tur­al pre­sen­ta­tion of prod­ucts along­side emo­tion­al, mag­i­cal and abstract snap­shots from the world of music cre­ates an excit­ing con­trast. “We are now devel­op­ing tools that enable employ­ees world­wide to hire agen­cies.” – Oliv­er Berg­er, Head of Glob­al Design Man­age­ment at Sennheis­er. 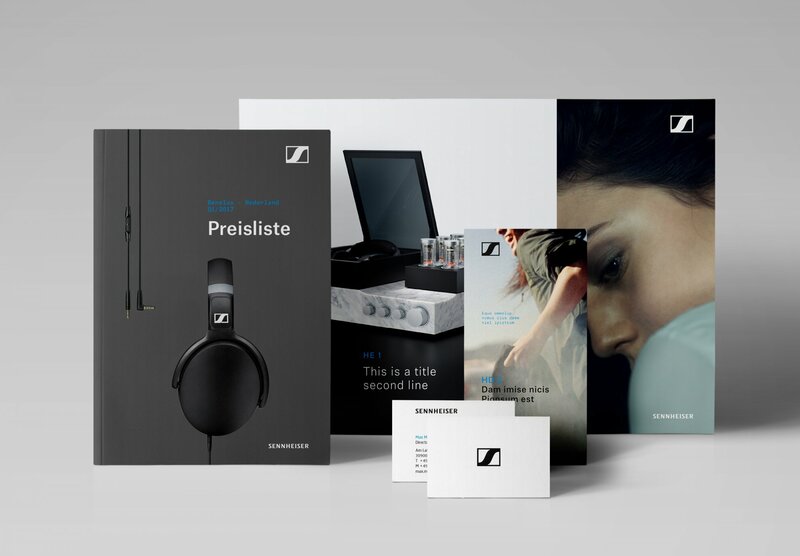 Sev­er­al film clips high­light­ing Sennheiser’s brand­ing con­cept and its new Cor­po­rate Design were pro­duced in-house. In the after­math of the re-design process, the brand man­agers had more to do than just write up the Brand Guides. The brand needs to be expand­ed now in every imag­in­able direc­tion. 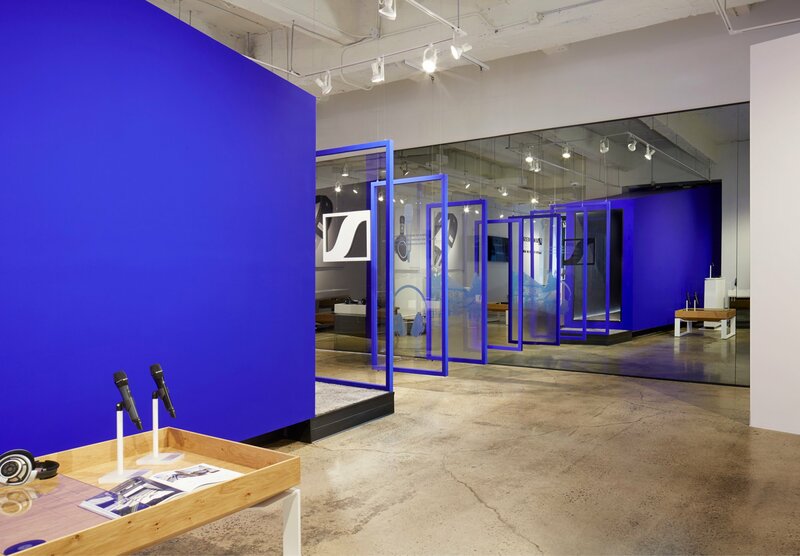 For exam­ple, pop-up stores were estab­lished in New York, where the prod­ucts and the brand could be direct­ly expe­ri­enced in var­i­ous sound spaces and through var­i­ous sound instal­la­tions. Imple­men­ta­tion was through exter­nal design­ers, but the design lead remained with the con­trac­tor. Lots of the ques­tions asked were prob­a­bly on most design­ers’ minds: What’s it like for a design­er to change sides and work direct­ly for the com­pa­ny itself? What work exact­ly does s/he have to do? And does it not get a bit bor­ing deal­ing with only one cus­tomer all the time? The respons­es were very inter­est­ing: The work def­i­nite­ly changes, you have to make a lot more calls, and some­times you’re see­ing a lot more of Word on your screen than InDe­sign. The in-com­pa­ny design­er does, how­ev­er, get much deep­er into the sub­ject mat­ter itself and can give impuls­es that guide the evo­lu­tion of the com­pa­ny and devel­op ideas that real­ly fit.